On Monday evening there was a OSIS steering committee meeting. The last one of these I sat in on was at Burton Group Catalyst. It was a good meeting – they talked about the European Identity Conference coming up in a few weeks where they will be again setting up and having interop demo’s based on the I3 work. Some of the European participants will be there. The agreement was that Interop4 would happen at Burton Group Catalyst continuing the work of I3 because it was not complete yet. As a community we had a good chance to talk about issues. The message that Roger did bring forward was that enterprise customers wanted less confusion in the market – because until it was clearer there would not be purchase of product. There will be more insight into this in the forth coming post about the the conversation I had with other executives at Oracle over a ‘blogger lunch’ on Thursday. Major ISSUE – there was ‘apparently’ two competing interop events at the same conference. One was backed by a large and well funded organization with a PR staff to promote itself the other was a fabulous grassroots effort – doing huge amounts with very little. It was agreed that next time Concordia and OSIS would collaborate and have an interop in the same place and have one press release (or at least two press releases with mutual quoting) although with different use-case focuses. This is my drawing of the picture that became clear through the meeting. OpenID Foundation and OSIS is a community group (there is serious consideration of changing our current description from “Working Groups” to “Community Groups”) of Identity Commons, the i-card foundation that is proposed would also be (there are some interesting questions about it). I worked hard on Tuesday morning before the OSIS interop on some signage for Identity Commons. We had the new diagram that is on the front page of the wiki along with a this sentence that i think goes a long way to describe who we are. Johannes pointed out that after that some articulation of the issues we are tackling could be listed. This is a list I recently wrote up and shared with a reporter (and she actually said it was ‘clear’). I will put the high level questions we are trying to answer in the context of the ‘clear’ articulation I sent her. Since the Web was built around “pages”, no tools or standards were created to control how the information about you was collected or used. We all agree that we need some kind of “open identity layer” for the Internet, but we don’t know exactly what that means or what it looks like. Our community has come together around some shared understanding of this and we continue to ’struggle’ with what it means and how it should work. We are working as a Community, on the development of the next layer of the web—for people and their information—the social-data layer. It’s going to take time to figure out, and lots of people have already been working hard for several years and have made significant progress. What are technical implementations of those standards?How do different standards and technical implementations interoperate? Identity Commons is the collection of groups where these conversations are happening. We need a broad and diverse range of participants. This layer once implemented will be as world changing as the World Wide Web of documents was for the Internet. I also think it is important to remember and emphasize that we are in a phase where there is a lot to get figured out and there is not ‘one answer.’ I think we as a community can tell a clear compelling story to the market AND continue to foster a lively and diverse conversation about the issues that are arising (technical, legal, social). It is some times is hard to remember how unclear things were 2 years ago but they were very vague then – if we continue to progress I am confident a market can develop for these tools. Both the peer-to-peer sessions on this topic were interesting and had a range of enterprise folks looking at these tools (a blog post about those will also follow in this series). 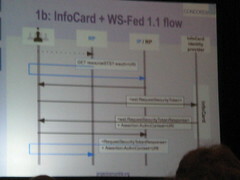 Here is a photo of the interop in progress – next post – interop videos – coming tomorrow. Over the next week I will work on the the 20 other posts that I have outlined this morning. – ok off to the airport now. Day One seems so long ago. I moved all my stuff over from the east bay on Sunday night – Pam was nice enough to let me room with her to save the 1 hour commute each way to home for the week. 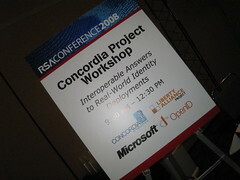 I got up early and headed to the Concordia Interop – I got their early enough to see the OpenID logo on the sign. OpenID has not been actively participating in these Liberty lead efforts for a while now and asked that their logo be removed from the website etc. Shortly afterwards a guy with white tape came and covered it up. 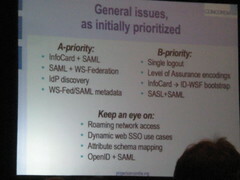 This slide explained their current focus and next focus. Eve handed the podium over to Mike Jones and he introduced the day and explained the three scenario’s they were demonstrating interoperability for. 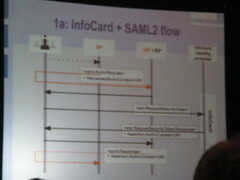 SAML and WS stuff with an emphasis on the enterprise use case. They shifted into demo’s at the back of the room and presentations at the front. 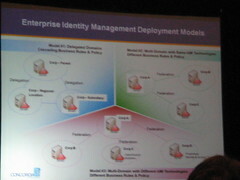 Lena from FuGen presented this slide. There was about 300 people in the introduction and this faded out. To be able to see this you need to get an expo pass. See below on how to get one. OSIS User centric identity network interoperability between identity providers, card selectors, browsers and websites demonstrates how users can ‘click-in’ to sites via self-issued and managed information cards, or i-cards. Open ID, Higgins Identity Framework, Microsoft CardSpace, SAML, WSTrust, Kerberos and X.509 components interoperate within an identity layer from open-source parts. I am really excited about this 3rd Interop – for one it is ALL Day not just an evening – I also heard they are going to have comfy chairs. To be able to see this you need to get an expo pass – one way to get it is to attend the other Interop Event. This one is also exciting – put on by the Concordia project at RSA on Monday April 7th from 9am-12:30pm. Registration is free of charge, and you must register for the workshop in order to attend the Concordia event, whether you’re an interop demo participant or not! Register for the workshop on the RSA registration site. Use the registration code 148CON. This will also give you a free expo pass that you can use to attend the tradeshow portion of the Conference Tuesday through Friday. I will be attending both and I encourage everyone interested in the topic and tracking the evolving state of the technology to do so. I shared with her that one of the largest vendor of nonprofit technology Kintera was a publicly traded company AND that there was big business opportunities for providing technology solutions in that sector. She looked at me surprised as if it had never occurred to her that you could make money in this sector. Recently the two other large vendors in the space merged – Get Active and Convio. They became just Convio and are now the largest vendor in the sector. This month’s theme for NTEN’s Newsletter is Data Interoperability. This is the open Letter the published there. It is incumbent on all software vendors serving the nonprofit sector to open opportunities for nonprofits to have greater choice and flexibility in pursuing their missions. To meet the expectations of nonprofits today — and five years from now — software vendors need to facilitate interoperability between systems and enable integration between offline and online data and the new Web. And they should do so with one clear purpose in mind: to open the possibilities for nonprofits to find and engage constituents to support their missions. The NTEN community has been leading the charge for openness. With Salesforce and Facebook, Convio has embraced openness as a way of doing business. 1. provide nonprofit organizations of all sizes and in any stage of Internet adoption the flexibility to integrate with other web or database applications to exchange constituent and campaign data. 2. make their Open APIs available to clients, partners, and a broad developer community. 3. expose Open APIs as part of their core product functionality. 4. proactively use APIs provided by other companies in additional to providing their own. 5. make their API documentation publicly available and provide a forum for sharing and discussing best practices and exchanging code examples. 6. publish a roadmap for their API development and encourage participation in the development of that roadmap. 7. make their APIs accessible to nonprofits at a level that does not require extensive technical expertise to leverage those APIs.